N-Flux is fitness that matters. We are a community that meaningfully engages with the world. We train here to "get out there." Fitness is about what you can do — for yourself and in the service of others. Want to learn Krav Maga? Chris Torres is the owner and master trainer at N-Flux. Chris has 14 years experience teaching martial arts and has taught hundreds of students over the course of his career. He earned his Krav Maga black belt in 2005 and his double black belt in the Fit to Fight Defensive Options system in 2017. Chris studied Muay Thai, Jiu Jitsu, wrestling, boxing, and other combat sports in an effort to become more well-rounded in the field and became the 2011 World Kickboxing Association Lightweight Mixed Martial Arts (MMA) World Champion. Chris views fitness as a necessary component for thriving in your environment and strives to create atmospheres that encourage perpetual development. Chris believes firmly that Neil deGrasse Tyson is a national treasure and American hero. 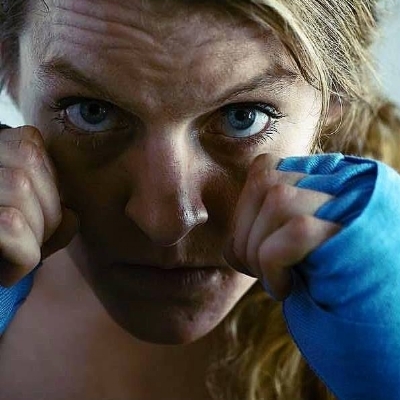 Colleen Daly is a competitive fighter - she has earned the title as the North Carolina State Champion for no-gi jiu jitsu and Good Fight World Champion in both gi and no-gi jiu jitsu at the blue belt level. She has competed in the local boxing circuit and is currently training for MMA. 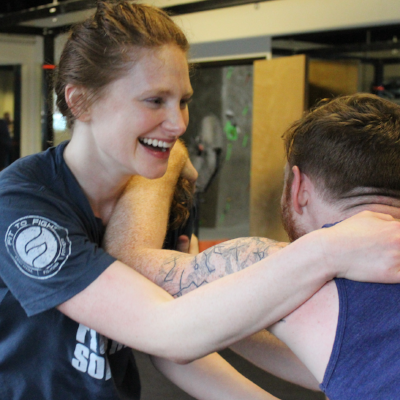 Colleen is a certified Fit to Fight instructor on the pathway to acquiring her own blackbelt. She has 8 years experience teaching fitness and personal training. Colleen is also the Executive Director of Guerrera: a feminist fight club that incorporates social justice activism into martial athletics. Kathryn Angstadt is the Chief of Staff at N-Flux. Kathryn is a Fit To Fight certified instructor and a green belt. Kathryn believes in “the offensive mindset” —cultivating mental and physical resiliency by identifying personal limits and pushing past them in every training. She is interested in tactical shooting and Obstacle Course Racing. Visit our MindBody page or download the N-Flux app on apple or android to sign up for classes.